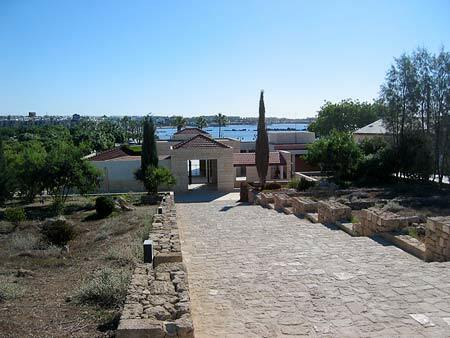 Located behind Paphos harbour, is the archaeological park of Paphos. It is a Unesco World Heritage Site, something that stresses the importance of the findings in the area. There are many wonderful things to see here, but it is the mosaics dating back to the Roman period, more than two thousand years ago, that make thousands of visitors to visit the archaeological park every year. Other top attractions in the Archaeologial Park, include the Ancient Odeon and the Saranta Kolones castle, a Byzantine era fortress overlooking the harbour. The Archaeological Park is open daily, all year round. During the summer period, (16th April – 15th September), the park is open from 8.30 in the morning until 7.30 in the afternoon. During the winter period, (16th September – 15th April), the park is open from 8.30 in the morning until 5.00 in the afternoon. Entrance fee: €4.50 per person. - Walking towards the Paphos Mall, about half the way on your right hand side, is the Agia Solomoni catacomb - a five minutes visit will give you a good idea of the catacomb and it is worth visiting.